I asked myself the same question. I know of Phantom power for microphones and I know of microphones that require no external power, but apparently there’s another type of microphones that require low external voltage. I came across this after not understanding why my mic works when I plug it into my on-board sound card, but did not work at all when I plugged it into my audio interface. 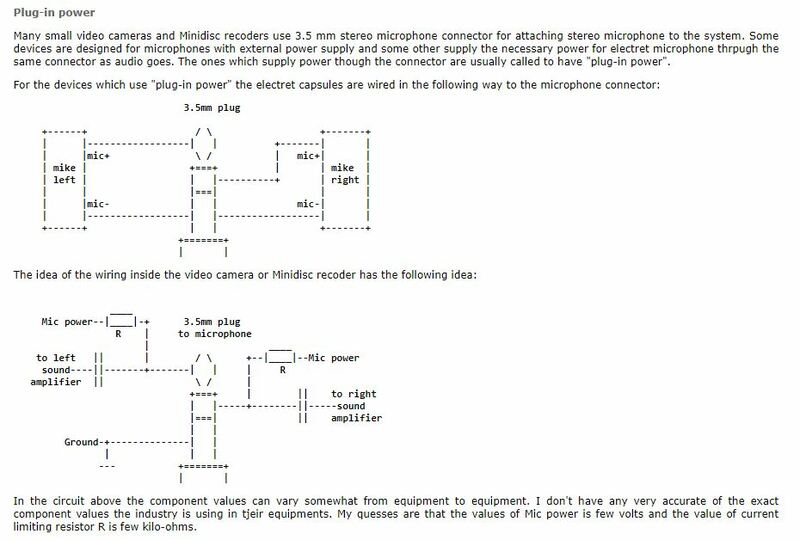 After a little bit of research, I discovered that video cameras and voice recorders can supply power to external microphones and that my sound card does it but my interface does not. I also found that there’s no real standard and that there are a lot of different implementation for it. There was not a lot of specific information about plug-in power, but I found this article which has some nice diagrams and examples. Since I have a stereo condenser microphone designed for voice recorders and cameras, I think it was only appropriate to use the example for plug-in power for those devices. I also wanted to keep both channels since I have two inputs in my audio interface. The principal is pretty simple. The microphone needs 1.5V – 5V on the signal contact to operate. The exact voltage is not specified, but i’ve tried between 2.5V and 5V and it works fine throughout the range. For safety, since I don’t know what protections are implemented in my audio interface, I don’t want to apply the power to the inputs of the interface, It needs to be filtered beforehand so that the injector will be transparent to the interface. 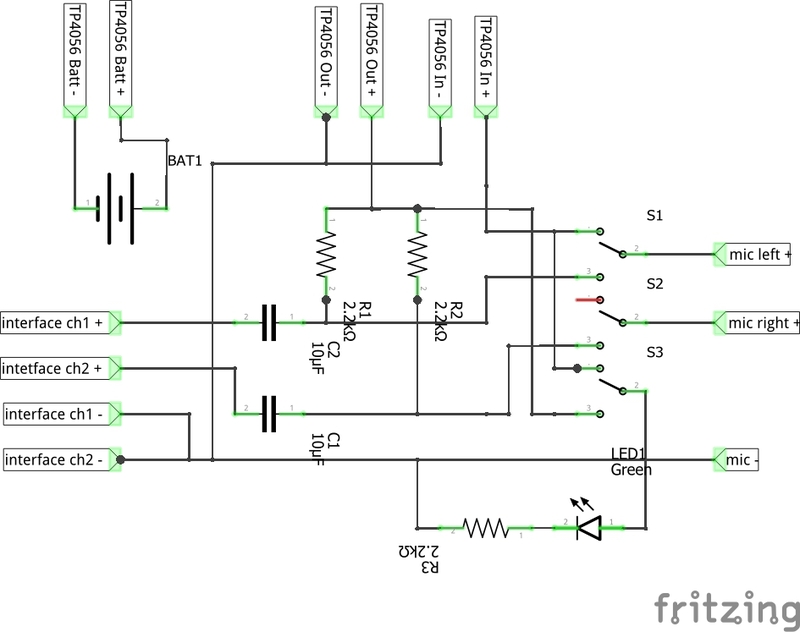 This is the basic circuit I came up with after seeing the different implementations in the article. R1 and R2 resistors limit the current of the power to the mic. C1 and C2 remove the DC component that we applied to the signal before it goes out, resulting in the signal alone. My audio interface is connected to the computer via USB. I didn’t want to use another USB port just to power the adapter, so I figured I could have the circuit inline to the USB power as well as the audio signal. The USB data lines are untouched, going straight through to the other USB connector. I used a type A and type B connectors for the “input” and “output”, but there’s no difference between the connectors. The circuit is in parallel to the power lines so they can both be used as inputs and outputs. I added a switch and an indication LED, stereo 3.5mm jacks for the audio inputs and outputs and tested the circuit. My interface has combo jacks that accept XLR and 6.35mm PL jacks. I made a small splitter cable from a stereo 3.5mm to dual mono 6.35mm connectors. The circuit works, but it’s very noisy. I’m pretty sure this is noise coming from the USB, dirtied by all the components in my computer. I could actually hear distinct noise when moving my mouse and when my HDD was spinning. I tried adding a resistor between each of the outputs (after the capacitor) and ground, like shown in the sound blaster example in the article, but it made things worse and the signal from the mic would get lost. I thought maybe a capacitor on the power input would smooth some noise out, but that didn’t do a lot either. To test my noise theory, I replaced the USB power input with a battery. If the noise is coming from the power input and not the mic or circuit, the battery should eliminate it. I made a small test circuit with a LR2450 li-ion rechargeable battery and it works flawlessly. There’s no noise, the mic is powered even thought the voltage is lower, and it sounds great. The USB solution seemed more elegant to me, but I guess it wasn’t meant to be. Maybe it would work better on a laptop. I used the test circuit until I had a good design for the next iteration and in that time I drove the battery flat, which is very bad for it. That was mostly because I didn’t have a convenient way to charge the 2450 battery. That made me realize that I need the charging circuit inside the device and not have interchangeable batteries. I used a battery from a promotional power bank I had. I decided not to use the circuit that came with it and use a TP4056 battery charging module. it regulates the output voltage and is suitable for charging single cell lithium batteries. I think the battery has under-voltage protection built-in, but i’m not sure and with a convenient charger and some discipline, I shouldn’t need it. To save some space, I used the mic input as the charging port. There would be no point in charging and using the device simultaneously, as I will be charging it from a USB port on my computer, which will introduce the noise I wanted to avoid. The final circuit looks something like the following image. Note that the switches are actually a single 3-pole, tripple throw switch with the middle position leaving the common pins not connected, thus making the OFF state. I wanted the device to be mounted to the audio interface and not be another dedicated box with bridging wires. I 3D printed a case that follows the shape of my audio interface and would be a kind of module that hooks up to it. The XLR connectors are strong enough to support the box even when connecting and disconnecting plugs. The back plate sits in a groove and is fixed with M3 screws and knurled nuts on one side. This was the only way I could fit the battery in there and still keep the shape and size. It works very well and the plate does not move. The XLR connectors were shortened with a saw to make room inside the box and are glued in place with epoxy. The files for the 3D printed parts can be found on Thingiverse.